Ever since I found out this past February that I’m going to be an aunt, all I can think about is what I’m going to make for the little tyke. OK, yeah, yeah, I hope the baby’s healthy and all that… And, yeah, I hope my sister-in-law has a healthy and relatively uneventful pregnancy… But the real questions are: what to knit? what to stitch? To the left, we have the latest WIP: “Baby Kimono” by Kristin Spurkland from the Summer 2005 Interweave Knits “Baby Gifts” section (the pattern is also available for free from Knitting Daily). Although I don’t usually like to repeat patterns, you can see another version I made for my cousin’s baby here. The yarn I used is ivory Suss Love, an incredibly soft 100% tactel nylon yarn that feels like cashmere (I swear!) but is washable. The pattern is worked all in one piece and I only have two halves of the two sleeves left to work. The pink stitch holder is holding the stitches for the right sleeve and my circular needles (Size 4, if you’re curious, and Size 4 if you’re not) are holding the stitches for the left. 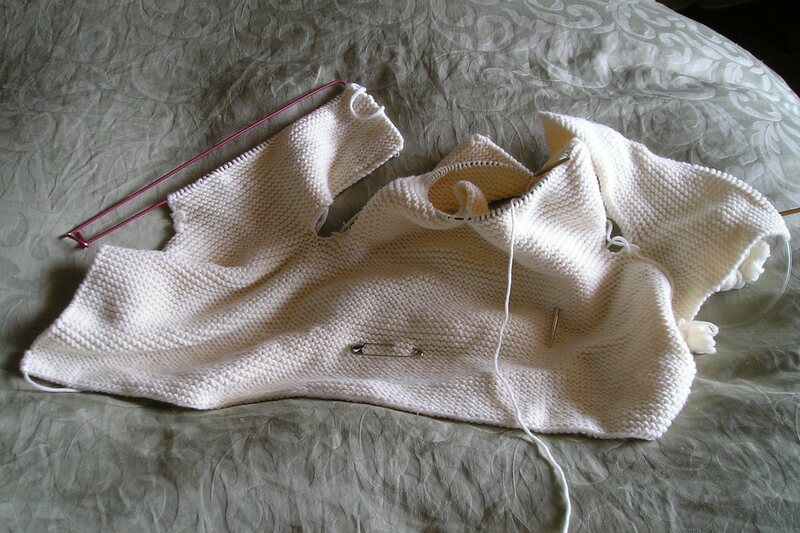 Since the entire piece is worked in garter stitch, the safety pin is marking the “wrong side” (the inside of the garment). Update 01/25/11: Sadly, Suss Love has now been discontinued.